For the perfect wine or cocktail pour every time, bars and restaurants in South Africa rely on Specialised Dispense Systems (SDS) for tailor made dispensing equipment. And, for precise flow control within these dispensers, SDS uses our own Model #130 check valve. Easily inserted into 3/8" tubing, this check valve is used in their BIB (Bag-in-box) dispensing system. The BIB connector is not a conventional auto shut-off type, and the valve prevents the product from leaking out of the supply line. 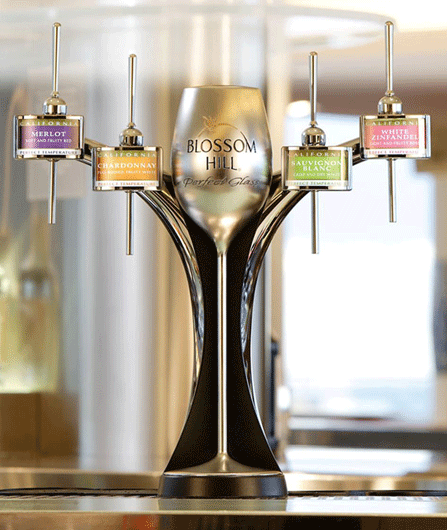 The BIB dispense system quickly and efficiently brings customers wine or cocktails at a perfect temperature. The sealed one-way system also ensures product life and freshness. With showrooms in Johannesburg and Cape Town, SDS manufactures, imports, sells, installs, and services a complete range of refrigeration and catering equipment for the African market. They focus on an innovative and diverse product range from global suppliers such as Smart Products. To learn more about SDS, click here. Available as a 3/8" standard cartridge design, Model #130 is inserted into fittings, manifolds, or installed in-line. 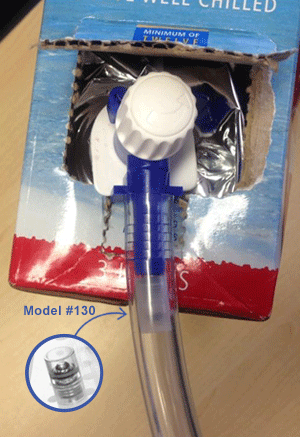 Like all of our valves, Model #130 is customized to fit unique design criteria by plastic body material, o-ring material, and spring pressure. Specifically, this model is available to be molded into Polypropylene, Nylon, Acrylic, Acetal, PVDF, Polycarbonate, Ultem®, and ABS. O-ring options include Buna-N, EPDM, Viton®, and Silicone. Opening pressures range from 0.17 to 20 PSI.